Millions of Christians suffer from dementia diseases such as Alzheimer's, making ministry to them difficult as they lose memories and the ability to communicate. Drawing on her years of experience as a long-term care chaplain, Kathy Berry provides practical information and tools to equip ministers and lay leaders to meet the spiritual and pastoral needs of those living with dementia. An invaluable resource to meet a growing need for congregations around the country, When Words Fail equips readers to answer Christ's call to minister to "the least of these." 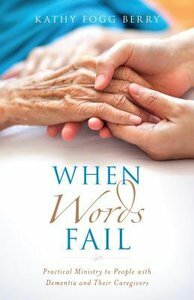 About "When Words Fail: Practical Ministry to People With Dementia and Their Caregivers"